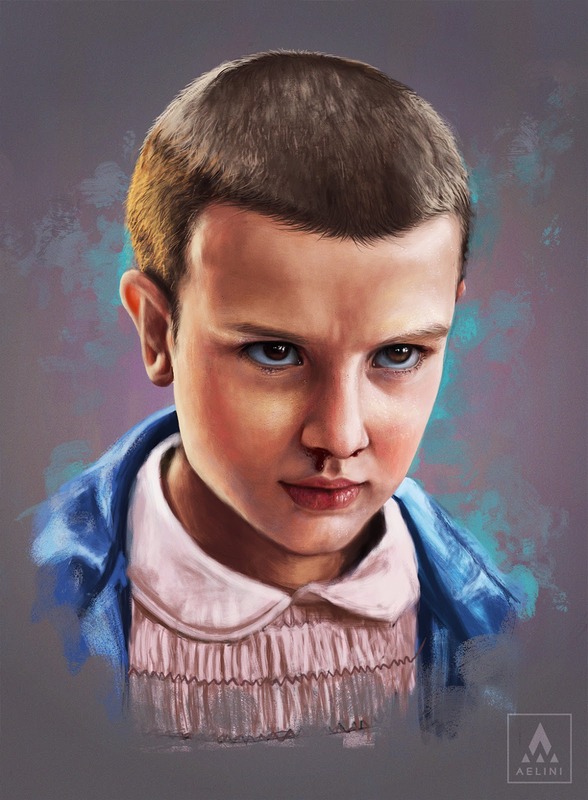 The Netflix series Stranger Things, which shortly returns for a second season, was the surprise TV hit of summer 2016. Fans and critics revelled in its allusions to Hollywood hits from the American 1980s in which it is set. Every haircut, every rippling synth pattern, BMX chase and adolescent gesture of friendship seemed to come from an 80s movie. Its young protagonists communicated through references to Star Wars and Dungeons and Dragons and the first trailer for season 2 shows them trick-or-treating as the Ghostbusters. So what made Stranger Things feel fresh and new? Was it somehow innovative in its referencing? It certainly wasn’t because of a new kind of aesthetic recycling, as JJ Abrams had already done an 80s Steven Spielberg pastiche with Super 8, and borrowing or referencing has long been prevalent in American cinema. From Film Noir’s adoption of German expressionist techniques in films like The Maltese Falcon or Touch of Evil to the postmodern genre-mashing of Pulp Fiction, Hollywood storytelling has a rich history of pastiche, allusion and homage. But what happens when serial TV does this? 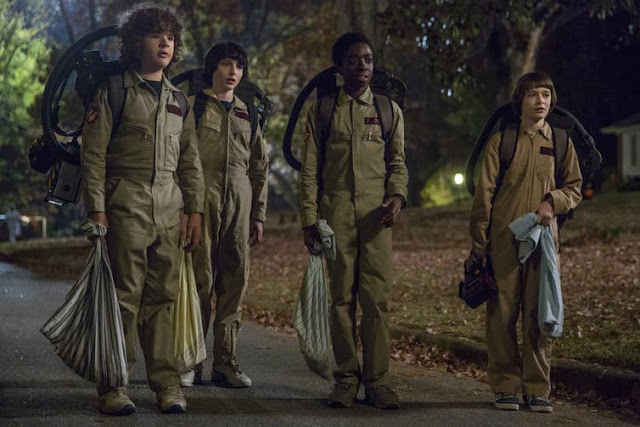 Stranger Things featured eight hour-long episodes developing characters who inevitably cannot exist solely in the stylistic shoes of Spielberg or Stephen King. And though the referencing is there, the immediate pleasures of its clever nods to E.T. or The Goonies evolve into a more sophisticated meditation on the processes of allusion. 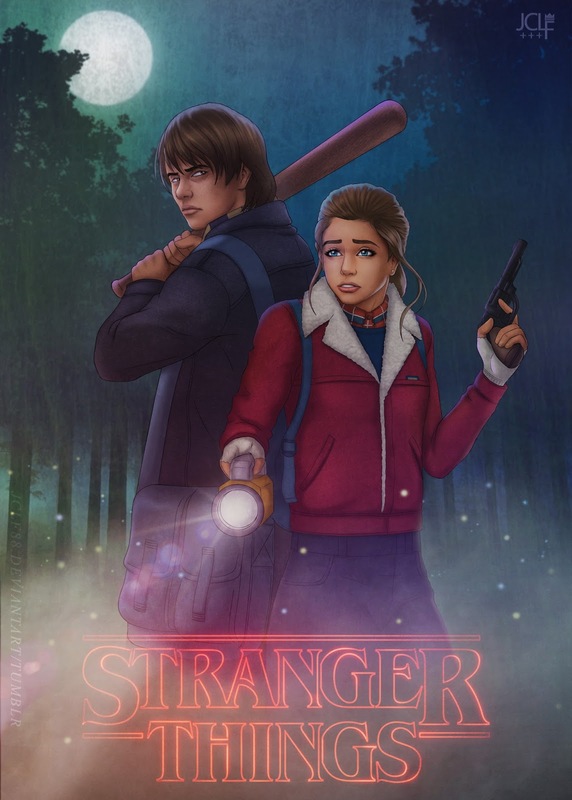 The achievement of Stranger Things is twofold. It is not just highly referential – it is actually about referencing. The series explores the way people – especially young people – communicate through patterns of reference or allusion. The programme’s retro register is also paired with an ongoing discussion of what we can see as the opposite of nostalgia – traumatic memory. 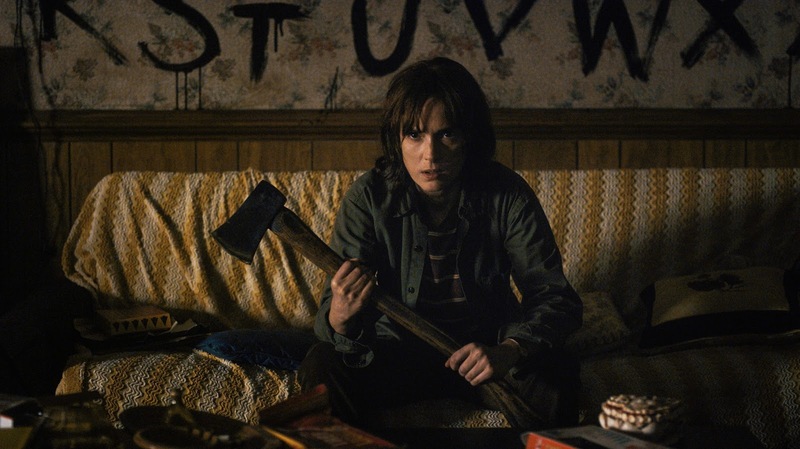 The casting of Winona Ryder is integral to this convergence of nostalgia and trauma. Ryder’s star power was born in the 1980s, when she was a teenager, through films like Heathers and Beetlejuice. In the 1990s her screen successes were accompanied by extreme tabloid scrutiny of her personal life. This included high-profile coverage of her struggles with drugs and anxiety. Because of this public history, the casting of Ryder was itself referential, as is the casting of any “star”. As Keith Reader argued in Intertextualty: Theories and Practice: “The concept of the film star is an intertextual one, relying as it does on correspondences of similarity and difference from one film to the next and on supposed resemblances between on and off-screen personae.” So while Stranger Things’ teen drama story, centring on Nancy Wheeler, evokes the high school world of Heathers, Ryder’s performance as Joyce Byers, draws on her real life experiences. Joyce is a loving, thoughtful, single mother and a sufferer of anxiety. This is exacerbated by the disappearance of her youngest son and for much of the first series she is upset and hysterical. Ryder’s performance was widely acclaimed – including by Rolling Stone journalist, Noel Murray, who suggested Stranger Things “brought her back”. Murray notes that the performance is powerful because the show takes advantage of what we already know about Ryder: that she is a “likeable celebrity who’s fallen on hard times”. Joyce’s hysteria certainly carries the power and authenticity of experience and it sharply juxtaposes the nostalgic innocence of Eggo waffles and BMX chases. Joyce’s experiences are also echoed by other strands of the story. We learn that Chief Hopper is still struggling with the traumatic loss of his daughter and it is inferred that mystery child Eleven, who is the subject of sinister experiments, was taken as an infant from her now-institutionalised mother. Ultimately, Stranger Things’ nostalgic frame magnifies the intensity of its traumatic realism and stories of loss and psychosis. Sometimes references serve as a code that adults and other kids won’t know – which is important as the boys are outsiders (geeks before geeks were cool). Sometimes references are charged with imaginative and emotional meaning. For example, Mike cites his missing friend’s boldness and bravery in a Dungeon’s and Dragons “campaign” as a reason for him and his friends to be brave in trying to find him in real life. 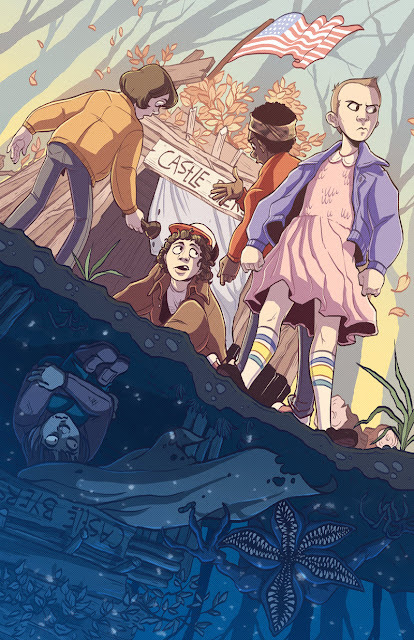 Literature academic and blogger Aaron Bady has pointed out that what makes Stranger Things’ allusions unique is that it has no “anxiety” over its gratuitous borrowing. This subverts the need “to play authenticity detective.” This is undoubtedly the case and it is striking in the world of “Netflix originals” where everything seems to be an adaptation or re-imagining, like House of Cards or Daredevil. But I believe what sets the show apart is its clever use of allusion to amplify the impact of its depictions of anxiety, trauma and loss and its exploration of allusion as a mode of communication.